Wild Luxury01485 750740work GlampingOur award-winning lodges are spread over two private camps at Thornham Bay and The Hideaway which are 3 miles apart as the crow flies and have easy access to great beaches. Serenegeti luxury lodges offer over 600 square feet of top quality safari style accommodation and provide sleeping accommodation for up to 6 people. Our two larger Zambezi lodges are only at The Hideaway and sleep up to 6 adults or families of up to 10. Not forgeting to mention our summertime exclusive-use, Wild Camp that can sleep up to 12 people who want their own outdoor adventure. All lodges are warm and cosy with master as well as twin or bunk bedrooms and also our very popular sleeping cupboard with ample room for two (or more!). There is also dining and living areas, sun deck and your own flushing loo and hot shower within the lodge. Kitchens are fitted with a wood-burning range cooker, cool-box, kitchen sink, dresser and a gas stove. 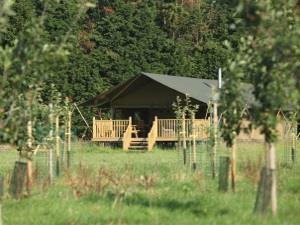 Glamping in NorfolkDon't forget to check-out our floor plans on the site pages. Lodges are well-spaced and we will arrange adjacent accommodation if travelling in a group. Everything you will need for your stay down to cutlery and utensils is provided. We also provide rechargeable lighting and an initial supply of candles. Cooking and heating is provided by wood-burning ranges that make our lodges warm and cosy. This is sleeping in the wild with a real difference. Accommodation has been designed to ensure that you get a real cosy night’s sleep whatever the weather. Bedrooms provide real beds and mattresses on solid wood floors and are divided into individual areas for privacy and comfort. Luxury Camping bedOur snug sleeping cupboard is particularly popular with younger adventurers and always creates a little debate about who is going to get to sleep in it! We also provide hot water bottles if you require to get into an extra warm bed. The range not only is an excellent cooker but also provides warmth in the evenings and night. We provide 20kg of wood briquettes for your stove and additonal supplies can be purchased on site. We provide warm duvets and pillows with guests bringing their own linen and towels. This is particularly good with younger children who love to have a little bit of home like their own duvet cover in their new and exciting surrounding. For a small charge bed linen can be provided. Our award-winning lodges are spread over two private camps at Thornham Bay and The Hideaway which are 3 miles apart as the crow flies and have easy access to great beaches. Serenegeti luxury lodges offer over 600 square feet of top quality safari style accommodation and provide sleeping accommodation for up to 6 people. Our two larger Zambezi lodges are only at The Hideaway and sleep up to 6 adults or families of up to 10. In the summer months we also operate a Wild Camp that sleeps 12 and goes places that normal camping would never be permitted - the ultimate crowd pleaser. The accommodation is not lodges but a combination of a beautiful star canopy, RV support unit with a fitted kitchen, shower-tower and sleeping/chill bell tents.